What were you most thankful for this Thanksgiving? I know there are 13 children in Minnesota who were thankful just to have a family this Thanksgiving! A couple weeks ago I had the privilege of being a part of the Hennepin County Adoption Days event, which I've painted at with my mom for several years. During this year's event 13 kids were adopted into 9 families. According to their website, Hennepin County has finalized 1,761 adoptions from 2000 to 2009. 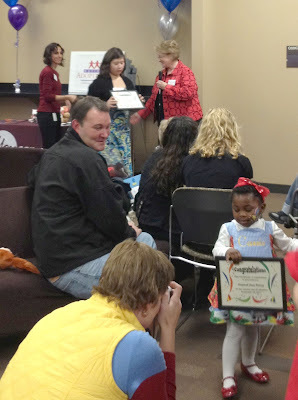 What a privilege to be able to take part in such a big day for so many families as they finalize their adoptions! This event is always held right before Thanksgiving, and serves as a timely reminder of what is really important in life. "There's no place like home"... this was the quote worn by one family who were all coordinated in custom made Wizard of Oz clothing for this year's adoption days! 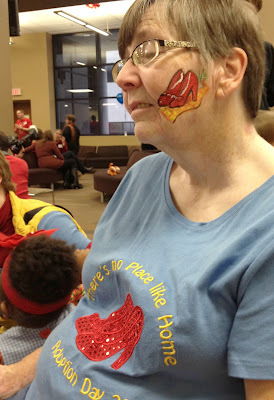 I had a lot of fun painting these ruby slippers, yellow brick road, and emerald city on the kids' grandmother! This was really my first attempt at a mask, and boy am I ever blind when painting myself without my glasses on! (And afterwards looking at photos, I'm always kicking myself for not putting on any makeup, pretty earrings, or something nicer looking than a sweatshirt, but oh well! It's just practice!) 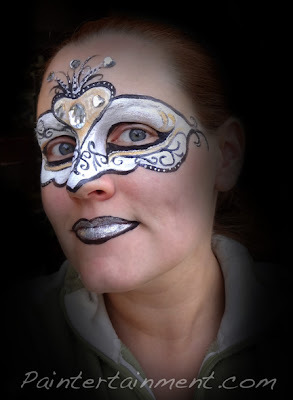 I always have to literally paint in super slow motion when painting myself like this, so this one took about a half hour. But, it turned out pretty cool in the end. 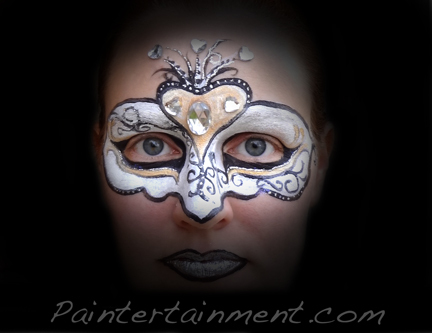 I had a lot of fun with my interferenz gold paint, metallic silver, and adding sparkly details with my Liquid Bling and also adhering some acrylic rhinestones with eyelash adhesive! Once I get some more time to edit my other photos, maybe I'll share the step by step process of this one too, if not here than on my free e-newsletter! New Acrylic Rhinestone Shapes Now Available! 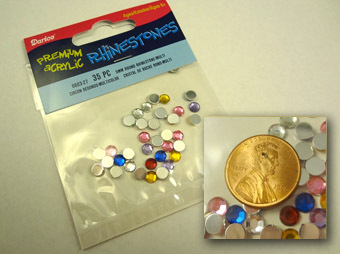 We've just received a new shipment of acrylic rhinestones! 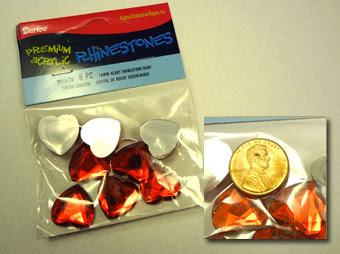 New additions to the assortment now include smaller 5mm round gems, tear drop shaped gems, and larger 18mm red hearts. 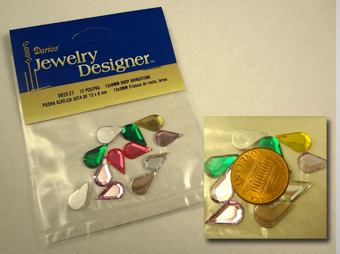 Check them out on our Acrylic Rhinestone page, where you can also browse our many other shapes and sizes, as well as adhesives!